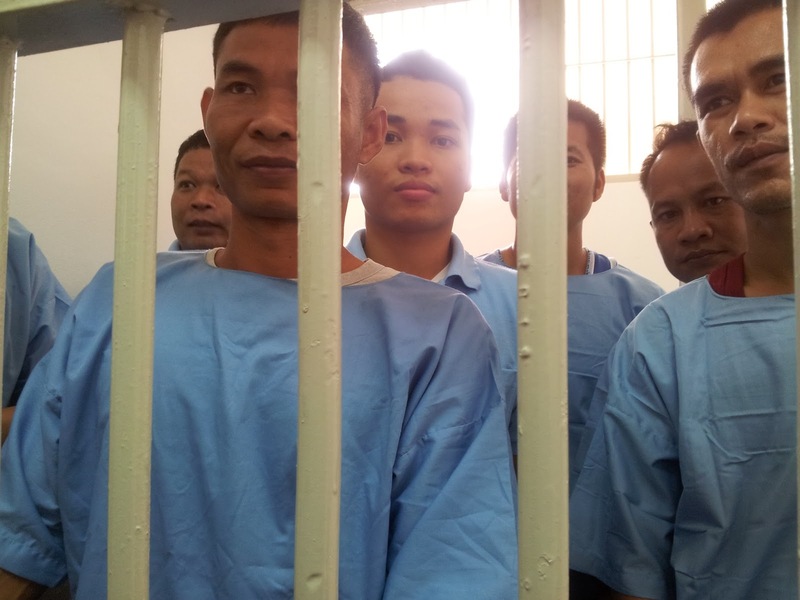 In late 2011, early 2012, I visited Thailand's lese majeste and political prisoners on several occasions, conducting a number of interviews with them. I spoke to Ah Kong, Somyot, Surachai Saedan, Joe Gordon, Tanthawut, Nat and many others including the Red Shirt prisoners in Laksi. At that time Amnesty International had failed to take concrete action regarding lese majeste (Ben Zawacki, the person most responsible for Amnesty's appalling failures, has since resigned) and Human Rights Watch had become infiltrated by politicised anti-Thaksin, pro-Army elements (unfortunately those persons remain in post at HRW). I also spoke to leading Pheu Thai Party figures, noted human rights activists such as David Streckfuss, trade unionists, such as Jittra Kotchadet, and other leading voices on lese majeste and human rights in Thailand. Much has changed since then - the worst part being the appalling tragedy of Ah Kong's death. On the positive side Joe is now free and back in the USA. As Somyot received his prison sentence today I've decided to republish the story below which was originally published on New Mandala in May 2012. I personally believe that until ALL political prisoners are freed - and I include lese majeste prisoners as political - there will be no real democracy or justice in Thailand. I also believe the present Pheu Thai government has not done enough to change the present situation and have almost run out of excuses regarding all the political prisoners. Their number is unknown yet is growing all the time. Most are thrown into cells which can hold up to 60 persons, where there is so little sleeping space some prisoners have to bed-down according to a rota and those on remand are shackled in chains for court appearances. Their crime? They’ve breached Thailand’s draconian 112 law, more commonly known as lese majeste, where any act deemed to insult or defame the monarchy, even made in private to a third party, can result in decades in prison. Take the case of Amphon Tangnoppakul aka Ah Kong, the 62year old retired cancer-suffering truck driver from the staunchly working class district of Samut Prakan just outside Bangkok who died in May 2012. His case initially drew worldwide attention after being sentenced to 20years in prison for sending four SMS text messages deemed to be in breach of 112 to an assistant of former Thai PM and present leader of the Democrat Party, Abhisit Vejjajiva. And while Amphon’s case and recent death grabbed the international headlines, plenty more haven’t. There’s journalist and left-wing political activist Somyot Pruksakasemsuk and Surachai Saedan, the leader of the Red Siam radical socialist movement, both of whom are awaiting trial on numerous counts of lese majeste that may result in decades-long prison sentences. Then there are others like computer programmer Tanthawut Taweewarodomkul who is serving a 13year sentence for being involved with a Red Shirt website and Nat Sattayapornpisut (recently released) who discussed the monarchy in private emails sent to an activist in Spain and who received 3years. There are many more lese majeste victims awaiting trial or investigation some for offences such as not standing up for the King’s song in a cinema while others are facing enquiries based purely on unsuitable body language. Yet, these developments aren’t recent and have been part of a process of ramping up of lese majeste cases that got under way in 2008 and escalated rapidly during the previous Abhisit-led regime. In many cases those targeted with lese majeste laws have been Red Shirt activists and supporters of ousted PM, Thaksin Shinawatra. The claim, according to UK-based freedom of expression advocates, ARTICLE 19, is that the lese majeste law has been used to “target political opponents”. This “politicisation” of the LM law is something the existing prisoners are fully aware of. A statement smuggled out from prison also claimed that during the period when the previous Democrat Party government were in power the lese majeste prisoners had received death threats from members of that government, that medical treatment had been denied to them and that there had been incidences of forced/punishment labour and other widespread abuse. During this period of Democrat Party rule neither Amnesty or HRW conducted any monitoring of prison conditions for lese majeste prisoners and both, as will be revealed later in this article, actually refused on several occasions to properly address the issue of lese majeste. How these conditions and the failure of the international human rights NGOs to monitor these conditions effectively impacted on the health of the recently deceased Ah Kong has yet to be ascertained. After the Pheu Thai Party won a landslide victory in the July 2011 election, Yingluck Shinawatra, sister to the former Thai PM, Thaksin Shinawatra - who was illegally removed from power in a 2006 military coup – has been installed as Thailand’s first female leader. Since that point Yingluck has had to contend with the worst flooding in living memory and plenty of sabre-rattling by Thailand’s notoriously coup-happy generals. This flexing of military power has been particularly vociferous when the issue of amending the 112 lese majeste law has been mentioned – reforms that were originally mooted when Yingluck first came to power. Even a body of legal academics, known as the Nitirat Group, who have put together a package of very mild reforms to the lese majeste laws, have come under continued and threatening attacks from military and extreme rightwing groups. Under difficult circumstances Nitirat are maintaining their reform-led position yet a “pogrom” like atmosphere is developing, with the burning of effigies of senior Nitirat members on the streets of Bangkok and even the previously highly-regarded Thammasat University banning the group from meeting on their premises. Nonetheless many are also criticising the present government for “back-sliding” on human rights after a number of Pheu Thai government figures said they would widen the crackdown on lese majeste. In addition a recent Human Rights Watch report attacks the government for failing to address the use of lese majeste and for extending this draconian law’s reach. However, HRW have drawn a huge amount of criticism from prominent human rights activists and others in Thailand for both their lack of commitment to protecting human rights in Thailand and for comments attributed to HRW’s lead Thai-researcher Sunai Phasuk found in the wikileaks US Embassy cables. In these cables Sunai has a number of statements attributed to him that make clear his support for the 2006 military coup that removed a democratically elected government, that he is a “committed anti-Thaksin activist” and that he believes a significant element of the Red Shirts were “bent on using violence to topple the monarchy”, a claim for which he offers no evidence. Sunai is also cited just after the 2006 coup saying how “close” he is to Thai Army officers and that he “had always held the military in high regard for their sense of honor and dedication to the country.” Given that only two years previously the Thai Army had been video taped engaging in an appalling massacre in Tak Bai that left 87 dead, this is an astonishing statement for a human rights worker to be making. One of Thailand’s leading academics and thinkers, Dr. Thongchai Winichakul, a former student radical who was present at the infamous Thammasat Massacre in 1976, has recently made very strong statements on the entire Thai human rights community’s failings on lese majeste and other issues in interviews he gave to me here and here. In these interviews Thongchai questioned not only the ethics of both Amnesty and HRW but also pointed directly to both NGOs being politicized. It is set against this entire backdrop that the present Yingluck Shinawatra-led government has recently opened a new political prison to house those incarcerated for crimes related to “politics”. All the lese majeste prisoners interviewed were keen to make it clear that they supported this move by the government and all considered themselves political prisoners. “We want political status,” said one, while nearly all of the prisoners also threatened to stage a hunger strike if they weren’t transferred to the political prison as soon as possible. I was granted unique access to the new political prison and spoke to several of those incarcerated there, none of whom have been charged with lese majeste and all of whom were awaiting trial or appeals. “We are much happier here,” was the resounding message delivered during our interview with them. 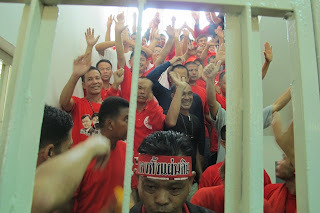 “We are all Red Shirts,” one said, “and while this government isn’t perfect, we know, unlike the last government, that it comes from a democratic election.” All these prisoners also spoke of prison “politicizing” them and that in the new prison they felt “more together as a group” and less “scared”. So where now for Thailand? The reforms that many consider necessary to return Thailand to full democratic normalcy appear to be hampered, under threat of force, by shadowy political forces while those usually relied upon to impart an independent account of what is going on in the country are seemingly politicized and failing to tackle key issues. The research for this article was conducted entirely before the death of Ah Kong.